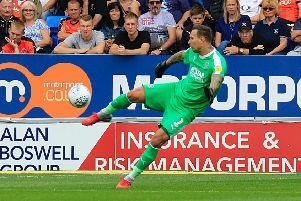 Luton striker James Collins conceded there was a real sense of relief over ending the longest goalscoring drought of his career with his first of the season against Charlton on Saturday. The 27-year-old forward hadn’t scored since finding the net in the 2-1 win over Mansfield back on April 2, some 14 games ago. However, once Pelly-Ruddock Mpanzu’s wonderful effort had cannoned back off the post, Collins was in the right place to convert the rebound and put his side 2-1 in front with nine minutes to go. Unfortunately it wasn’t the winning strike, as Athletic hit back in stoppage time to level, but on breaking his duck, Collins, who then made it two in two with the equaliser at Oxford United last night, said: “On a personal note, it’s a big sigh of relief, but I’m gutted to concede in the last minute. “I like to show that it doesn’t bother me, but it could have been my longest run without a goal. “It all stemmed from last season, the last six games, I was desperate to get the 20th league goal and it wasn’t to be. I like to show that it doesn’t bother me, but it could have been my longest run without a goal. “Then going into this season I was always confident I’d score goals, it just whatever reason wasn’t going for me, but the team was scoring goals. “We had Elliot (Lee) scoring, Hylts (Danny Hylton) scoring, Matty Pearson chipping in, so I know it would come eventually. Collins was thankful the ball finally dropped to him in the area too as moments earlier, when Elliot Lee’s shot was saved by Jed Steer and bounced just out of his reach, it looked like it would one of those days again. He continued : “ I’ve been in loads of positions this season where the rebounds haven’t quite come. “There was a couple at Wycombe where we hit the post and even one in the first half, Jack’s (Stacey) put it across, I don’t know how I haven’t got on to it. “But I knew it would eventually come, I’m always confident I can score goals and I’m delighted to get the goal, but it’s not really about my goal, it’s about the result. “I said to Pelly, thanks for the assist, but also what a goal that would have been. “He’d have deserved it as well, as he’s been fantastic this season. The celebration had that bit extra too as Collins sprinted to the home fans before unleashing a kneeslide and then being engulfed by his joyous team-mates. He said: “I thought it would be the winner at the time, and there’s no better than feeling as a striker than to get the winner in a big game like that. Despite Collins’ struggle to score, team-mate Harry Cornick, who also netted his first goal of the season at the weekend, didn’t think it had affected him away from the game. He said: “He was the same in training every day, he scores every day, so it was just one of them for both of us. “We had chances this season, sometimes we’re unlucky, but both of us scored and it should give us both a lot of confidence to go on and score more. Meanwhile, boss Nathan Jones had never been overly worried by the former Shrewsbury and Crawley attacker’s lean spell this season. He added: “His general performances have been good, it’s just he’s probably lacked that killer instinct. “But he’s led the line, won his headers for Harry’s goal and he keeps plugging away.